Missing Boots, Besotted Mothers, and Western Sounds! 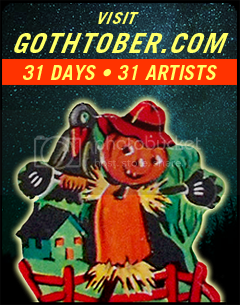 I’m sure you thought we forgot about things here in gothtoberland, but we have been busy getting everything ready for your viewing pleasure. That and we had a fantastic CrafttNight at AKBAR in Los Angeles putting together the fantastic cars that Lush Newton (day 10) designed. But here you go. Have you ever lost your shoes? Really lost them? Especially the boots that you really loved and are just dying to wear to go out dancing tonight? Well, XKiller did, and she made a great flash animation about it. You can see that on day 14. Day 15 features Miss Lori, who returns to gothtober with a puppet operetta about a besotted mother and her little girl. There are lessons to be learned about how to dress your child – don’t you ignore them! Day 16’s Dark Adams is also a gothtober veteran, and he gives us a peek into the Weird, Wild Old West (or at least what it may have sounded like.) Follow the instructions and download his mp3 file for your listening pleasure.